Original Westfalia California. 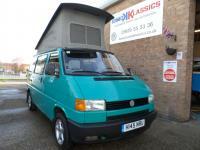 LHD fully equipped 4 berth camper van. Manual transmission and 2.4 Diesel engine. Pop top roof, interior facilities include hob, grill, sink, gas fridge, swivel seats, 240v hook up and 12v socket. Rear seatbelts are also fitted. Fully serviced. 12 months MOT, 6 months tax.